Shiner softball team and coaches celebrate their 1-0 victory over Grapeland for the Class 1A State Championship on Saturday in Austin. Typically, in a state championship game, a team typically leans on their seniors to come up with big, timely hits. For Shiner, it was a pair of young players stepped up for their lone run. 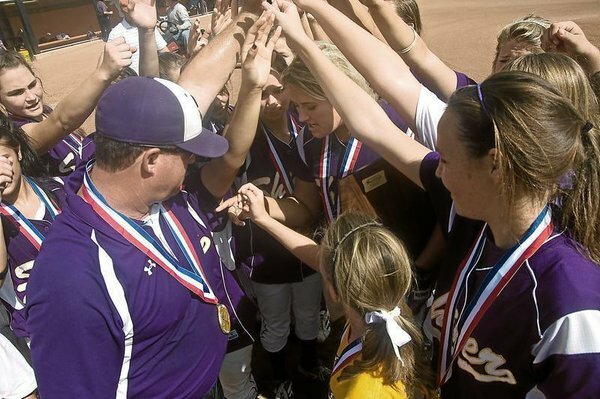 Freshman Kristin Schacherl and junior Ryah Michalec hit consecutive doubles in the sixth inning to bring in the only run as Shiner beat Grapeland 1-0 and claim the Class 1A state championship at McCombs Field on Saturday. "We came out on top and it's just an amazing feeling," Michalec said. The game was scoreless headed into the sixth inning and with the sun getting high in the sky and temperatures rising, fatigue was a factor. "I thought she started to get a little bit tired, just as Ashley (Shimek) did," said Shiner coach Brandon Siegel about Grapeland starting pitcher Summer Groholski. "I could see that she was slowing down a lot," Schacherl said. Schacherl led off the sixth and quickly fell behind Groholski with two strikes to no balls. Schacherl launched the third pitch from Groholski to left field, making it a tough play for Sandiettes' left fielder Kaylee Gayle. Gayle went back and stretched out for the ball, but it hit her outstretched left hand and popped out, allowing Schacherl to take second base. It put a runner in scoring position with no outs. "I knew that my team needed it and I was proud of myself for hitting it that far and getting a double," Schacherl said. Michalec followed Schacherl in the batters box and boomed a ball to deep left field that appeared to be headed over the fence, but the ball hit the fence for a double and Schacherl scored the go-ahead run. "We all just jumped up and just yelled in the dugout, we were so excited," said Shiner starting pitcher Ashley Shimek. Added Schacherl: "I was just so happy that I got in and that Ryah hit me. It was such a great feeling that I was the only run that scored." Although the Lady Comanches stranded two runners in the inning, the damage was done and Shimek went back to the pitchers circle with a lead and six outs to go for a state title. Senior pitcher Ashley Shimek was named the Most Valuable Player after pitching a complete game two-hitter and striking out five Sandiettes. Shimek was a perfect 24-0 this season. The game was a pitcher's duel throughout as Shimek and Groholski combined to allow three hits going into the sixth inning. "We got a couple of timely hits and that was the difference in the ball game," Siegel said about the pitcher's duel. Shimek retired the side in both the sixth and seventh innings, to preserve the win for the Lady Comanches. Shimek didn't give up a hit after the third inning and didn't allow a Grapeland base runner after the fourth. Shiner was making its ninth state tournament appearance in the last 15 years and for Siegel, it was his second state championship in four seasons. "It'll never get old," said Siegel about winning a state championship. It was a sweet ending for Shimek, Holly Haas and Amber Ramirez, the three seniors on the Lady Comanches squad. "We've had such an amazing time this year and had so much fun together and got closer to all the younger girls," Shimek said after her final game as a Lady Comanche. "It's been amazing." Added Siegel: "It's almost hard to put into words that senior class doing what they did. It's a great way for them to go out." The graduating seniors made three state tournament appearances and won two state titles. "Not many kids get to experience this and I'm lucky," Shimek said. Haas got the first Shiner hit in the fourth inning with a single as the Lady Comanches managed only seven base runners. The table was set for Shiner to take control in the fifth, but a call went against Shiner and the game remained scoreless. Jordan Pietsch led off the fifth inning by reaching on an error. Grapeland second baseman Julie Riess couldn't coral the ground ball and the Lady Comanches had a runner on with no outs. After a sacrifice bunt and a groundout the go-ahead run was 90-feet away with Shimek at the plate. Shimek quickly got ahead two balls to no strikes, and Groholski's third pitch of the at-bat appeared to hit Shimek's shoulder, but the home plate and third base umpires ruled she came around on a check swing. Shimek fouled off the next pitch down the first-base line and was put out by Shelby Bruner. One inning later the Lady Comanches came up with the winning run. "It's the best feeling in the world, I couldn't be happier," Schacherl said. WP: Ashley Shimek (24-0); LP: Summer Groholski, 27-9. Ryah Michalec, 1-for-3, RBI; Holly Haas, 1-for-2.